What do you get when a Grammy-winning group performs inside the world’s smallest museum? The first-ever iMadiba ACE! So, you know all about the wonderful iMadiba Project (a global, interactive, participative art project creating conversations for change). Well, the project has launched an exciting new mini project within the larger one: the opportunity for artists to collaborate and create one-of-a-kind iMadibas anywhere (and everywhere) in the world. These will be known as the iMadiba Artists’ Collaborative Edition installations (ACEs). The goal of the ACEs is to work with prominent artists, both local and international, to create unique iMadiba installations at significant locations around the world and creatively stimulate more conversations for change. The number of ACE iMadiba installations will be limited by the number of artists and locations determined by the curators. The curators can commission an artist or accept a proposal from an artist. The iMadiba ACEs must remain an interactive art installation and it should allow for groups to sit in discussion. The talented, home-grown, Grammy-winning legends at Ladysmith Black Mambazo went one step further; they allowed people to sit in the site and be inspired by music and now you can experience that too by watching one of the videos below. Their collaboration with iMadiba artist Erhardt Thiel is the first collaboration and what a way to launch this exciting new mini project. 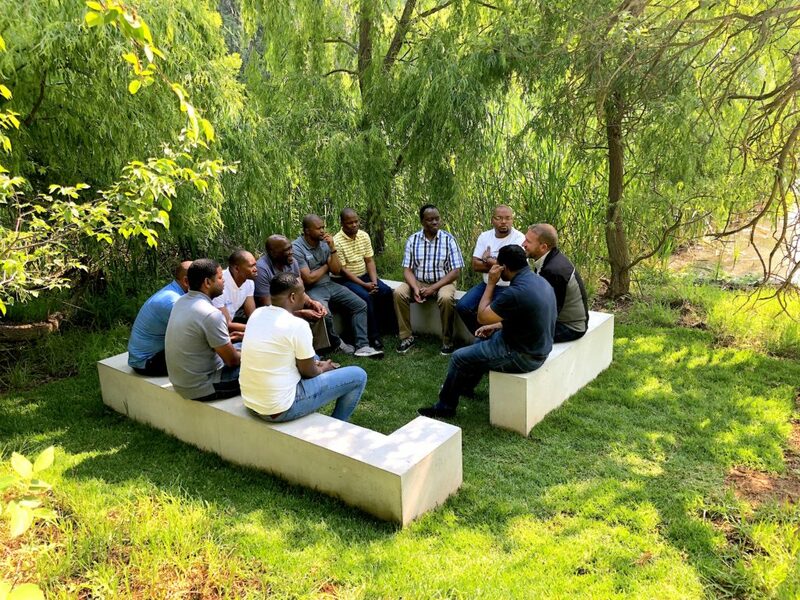 All iMadiba installations must work on the exact dimensions as defined by the ‘Blank Canvas’ copy at the Nirox Sculpture Park. All iMadiba ACEs will form part of the larger iMadiba Project. As you may already know, the iMadiba Project has been built in partnership with and in support of the Nelson Mandela Foundation. One of the aims of the project is to assist the foundation in its objective to honour Madiba’s legacy and to have dialogue. It has been made possible through the support of sponsors, and the ongoing need is to find more sponsors as the project grows. The project produces income for the foundation. iMadiba artist Erhardt Thiel hopes to erect at least 100 installations in Madiba’s centenary year, ending 17 July 2019, and to continue to grow this project globally. While the iMadiba Project has a good footprint, the Nirox Sculpture Park copy is the first of the iMadiba ACEs. ACE stands for Artist Collaborative Edition. Bidvest Insurance are getting ready for liftoff! AIE conference 2019: early bird special ends soon! The MAKEUP REVOLUTION is officially on Clicks SA shelves! We are super stoked that Makeup Revolution is FINALLY available in 45 Clicks South Africa stores today with over 160 products on the shelves.